Scene of Nicanor's unsuccessful attack upon Judas Maccabeus (I Macc. vii. 31; comp. Josephus, "Ant." xii. 10, § 4). The exact site is somewhat doubtful. There are several names of places in modern Palestine between Jaffa and Jerusalem which may be identified with this one. Kefar-Salama has been supposed to be identical with the Carva Salim mentioned just before the Crusades as being near Ramleh, where later was a casal of the Knights Hospitalers. 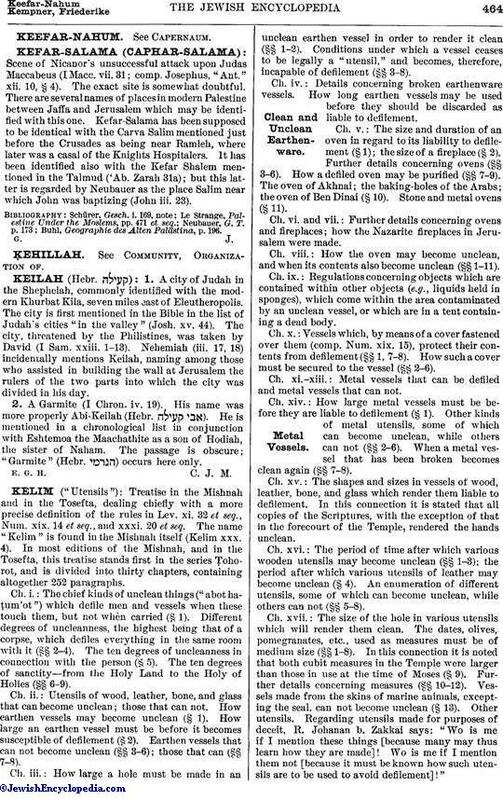 It has been identified also with the Kefar Shalem mentioned in the Talmud ('Ab. Zarah 31a); but this latter is regarded by Neubauer as the place Salim near which John was baptizing (John iii. 23). Buhl, Geographie des Alten Palästina, p. 196.